Treat him like royalty, and Trump will come. 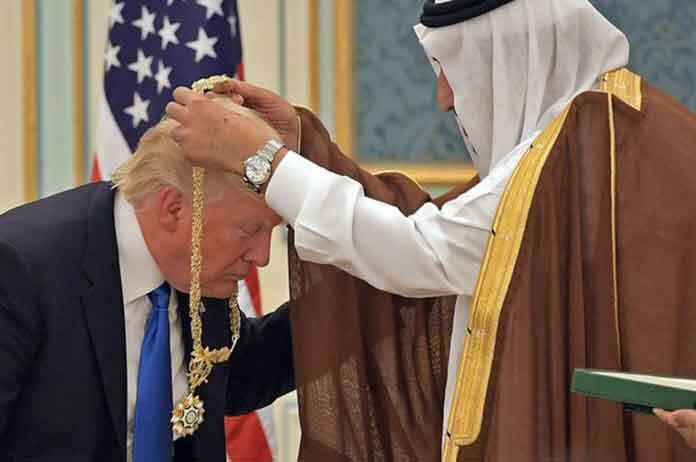 The American people have been watching Trump's visits to foreign countries with a combination of fear and loathing since he first set foot in Saudi Arabia. When Trump went there he was treated like royalty, a requirement he sets for any country that wants a visit from His Orangeness. 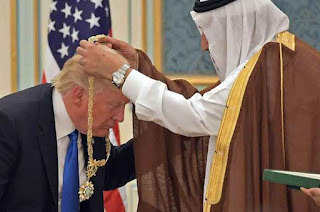 The Saudi royals did a sword dance with Trump (big honor) and made sure his trip to the royal palace was lined with pictures of Trump and top Saudis grinning happily. There were no protests, because protesters in that country tend to lose their heads. England couldn't guarantee there wouldn't be a massive protest against Trump visiting their country. So America's closest ally in Europe won't get a visit from America's president. Most of the other European countries contacted basically said the same thing; they couldn't assure Trump he wouldn't be rudely greeted upon arrival. There's some countries, like Poland, who can guarantee there will be no protests against Trump and his minions. According to Polish press reports, the government secured Trump’s attendance by promising a rapturous welcome from the Polish public – in contrast to the frostier reception he might expect in western European capitals. How's that possible? The new right-wing government (that hates Muslims) will see to it. Trump is due to arrive in Poland this evening and deliver a major speech in Warsaw on Thursday afternoon. Poland’s ruling right-wing Law and Justice party (PiS) has struggled to contain its excitement since the visit was announced last month. Trump’s trip to Warsaw has prompted concerns over a presidential strategy that threatens not to unite Europe but to divide it. The rest of the world is on notice: If any country wants Donny Little-Hands to drop by for a day or two, prepare to throw a bigly celebration in honor of His Donaldness.